Over nine years of corporate web design and development experience. Experienced in both client consultation and project management. Developed, enhanced, and/or managed various branding, marketing, and promotional campaigns. Effective Team Player – known for creativity, adaptability, continuity, and attention to detail. Prominently experienced in developing mobile responsive web design, high-end graphic design, and multimedia creatives for corporate clients in the energy, retail, and technology sectors. I worked on a variety of projects all varying in scope. My time spent as a freelancer was focused on web development, client brand management, innovative brand marketing strategies, client consulting, creative design, mobile app development, video production, and photography. My largest ongoing project was the design, development, organization, and distribution of monthly custom product catalogs for all 92 member clients. I managed several large projects that relied on team collaboration such as the redesign of the front-facing website; edge.com, the annual company conference creatives, and all internal and public company creatives and email communications. I worked in tandem with the owner and a junior illustrator. My time there was focused on WordPress theme customization and development. My common duties included facilitating client meetings, maintaining client websites, creative design, branding design, and mobile responsive web design. Designed, developed, and managed “Defender Network” news and information website. I managed all graphic design and communications-related projects. I reported directly to the chief editor. I worked with a small team to develop the citywide “Whos Got Game” HISD basketball tournament branding strategy and promotional campaign, yielding a 20% increase in online subscribers. Self-managed position as lead designer on a wide range of web-related projects, including the design of the company Internet, and Intranet. Primary Functions: Design Organize and Develop vendor sites and online marketing campaigns. 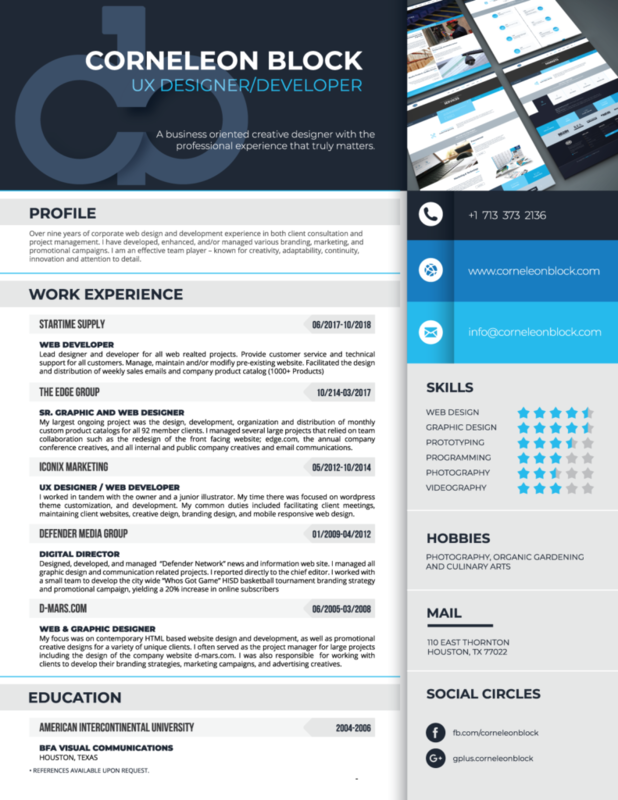 My focus was on contemporary HTML based website design and development, as well as promotional creative designs for a variety of unique clients. I often served as the project manager for large projects including the design of the company website d-mars.com. I was also responsible for working with clients to develop their branding strategies, marketing campaigns, and advertising creatives. Primary Duties: produce contemporary HTML based web design projects and promotional print, project management, develop and design client identities, marketing campaigns, and advertising creatives.